Description: mood changes caused by corticosteroids are usually minors (e.g. insomnia, anxiety, irritablity, short-term memory loss and difficulty concentrating). In very rare cases, severe symptoms do appear (e.g. depression, delusions, euphoria). Frequency : minor mood changes are commonplace. For example, 40 to 50% of patients reported insomnia, irritability or anxiety. 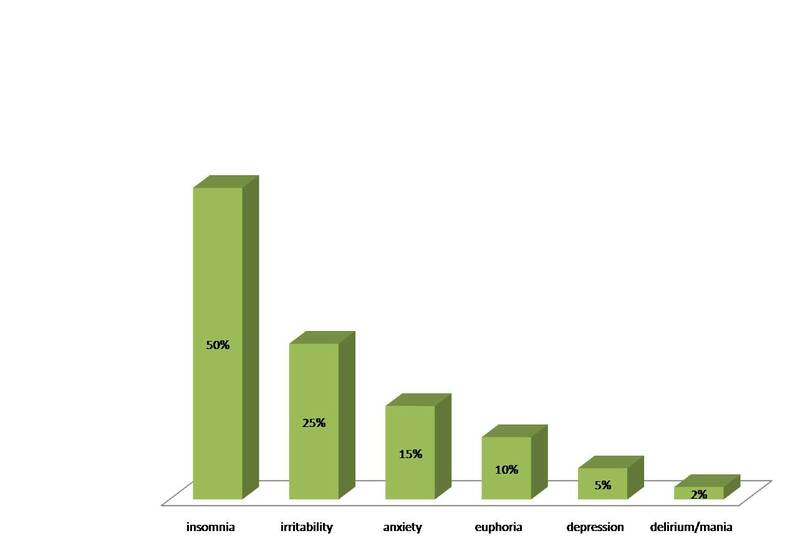 Severe neuropsychiatric disorders are much rarer and only concern about 5% of patients. Any onset of these severe side effects requires the immediate attention of a doctor. Subjects at risk: the risk of the side effects depends on the dose. The more corticosteroids prescribed, the higher the probablity of neuropsychiatric side effects experienced by the patient. Older males are more predisposed to delusional or manic episodes. Women are more at risk for depression. A history of psychiatric illness seems to predispose people to recurrences of their mental conditions upon beginning corticosteroids. Short treatments versus extended treatment: these effects can take place right from the first days of treatment. Therefore, both short and long-term corticotherapy patients are at risk. Prevention/Treatment: the search for the lowest effective dose of cortisone is key to preventing the onset of these symptoms, especially among those most at risk. If these symptoms occur, the doctor may decide to reduce the dose and/or prescribe an adapted treatment (e.g. sleep medication, anti-depressants). Reversibility: these symptoms disappear upon one’s discontinuation of the corticosteroid therapy. The best way to prevent side effects is to know about them. You should be aware that corticosteroids can cause these symptoms and they are not necessarily related to your illness or a “psychological fragility”. As soon as you experience them, contact your doctor so that a proper treatment is followed as soon as possible. Tell your family and loved ones that treatment with cortisone can cause mood disorders such as irritability, anxiety or even a sense of euphoria. This can help them understand your mood swings and behaviour. If these symptoms become severe, immediately consult a physician.